Our latest success story is a group of new websites all launched on the same day. One is called MoleRemedy.com. We launched their web site on May 6,2005. In just 16 days they were on page #1 of Google and Yahoo search engines. Four days later MoleRemedy hit the #1 spot on MSN. 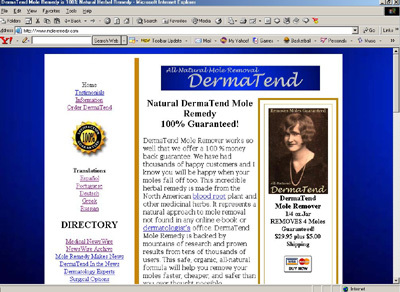 Aaron Lilly; owner of MoleRemedy.com and a few other Internet sites had this to say about RenoSEO: I was really worryed if RenoSEO could deliver what they say and let me assure you my results were immediate. From Day 1 of their optimization my sales doubled. I let them launch a new site for me and that one is on page one of Google already in less than a month. Reno SEO can put you on the page one faster than any other SEO Firm. Our guaranteed methods offer a money back guarantee if we fail to improve your current position. In this day and age it's important to put your dollars where they are the most benefit. Put your dollars into optimization first. Do not waste a penny of your current budget plans without at least calling Zane Durant at (808) 250-1846. The first call is free, or send an E-Mail.